I am a new guy. So I am ready for the feedback that I stupid and posted this in the wrong place. Just trying to find my way! I have begun restoring a 22' cold rolled wooden sailboat. Some of you might have seen this for sale in southern California. Its in my shop now. I posted some pictures, including one photo I found that is a sailboat that looks "similar" and I will pass the "information" that the seller passed to me. Seller states it is late 50s vintage. Hauled on its trailer from Michigan. Aluminum mast and boom might have replaced original wood ones. Came with 2 sets of sails, and 2 spinnakers and is rigged for a spinnaker with pole. Sanded the gray paint off a 12"x12" area and it has mahogany outer layer. Will look great when stained and varnished. Actually, all is there and if it does not sink, it could be rigged and sailed right now. But will go through it. OK, what is it? Any info? Looks like a Hogdon 21, which I think might also have been sold as the Great Lakes 21. If I'm right, plans are available from our sponsor. Roller furling is a pain. Very slow to roll up or down, useless for reefing. Plan on getting rid of it. Everyone has a preference, before changing anything I would try it in practice. Whatever she is, good luck with her, keep us posted. I've been re-reading Maurice Griffiths books about sailing the coast of England, he seems to have rather liked roller furling. We like the roller reefing on Talisman, too. Quick and easy, never any problem. What a fun boat. Paint and sail her fist before changing the rig. A good roller furling would make her easy to handle and depower. Since the former owners changed the rig, there is a good chance she is well thought out. The possibilities to turbo it are good too. A large nose is the mark of a witty, courteous, affable, generous and liberal man. My feature suggests an excellent side kick of good index. As far as reefing a roller furling jib, my sailmaker suggested "Try it", which I did and noted that Hey! it works. Not as well as a 50% smaller jib perhaps, but when conditions actually dictate reefing or furling the jib, staying off the foredeck is the correct answer. Racing is different, you can risk your life for that. Back to the original post: cold rolled is a process for making steel - cold molded is the technique for building boats with thin veneers and epoxy glue. But I think if your boat is from the 50’s it’s probably hot molded. The veneers were coated with glue then placed over a mold and heated in an autoclave under high temperature and pressure. This technique was used in England a lot after the war and in the US, too, a little. I have a hot molded canoe built by Luders in Stamford ct that was built this way in ‘46 or ‘47. Lots of the Luders sailboats were built with this technique. It originated with their minesweepers in the War. 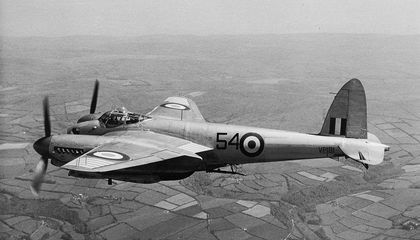 During WWII there were many "wooden" airplanes produced in England, the US, and Canada. After the war, lots of pretty big autoclaves and the US economy really broke loose with massive industrial capacity suddenly looking for a civilian market. The post-war pre-glass pleasure boat explosion in the US was fueled right there. Many small boats, like the Thistle, came flying out, and some larger cruising boats. It’s not a Dragon like the last pic you posted, but’s it’s a really nice boat! So we did some snooping about with all the great information posted. Yes, the boats hull is molded, not rolled. I mis-wrote the word. The boat is VERY similar to the Hodgdon 21 that Johnw lead us to. Like 95%+ match. Maybe the builder made a few design changes to mine like cockpit combing, etc. So very, very close to the design that if there are no better leads by the time we are done with the resto, she will be a Hodgdon 21 when she hits the water. Then, with my typical luck, some guy will come up to me at the dock and state, thats NOT a Hodgdon 21 its a Smithinheimer 21 you idiot! With the great mahogany shell, she will be stripped, stained and varnished. Dont know whats under the paint on deck but its not teak. Darn it! So most likey get white urethane and nonskid. Will trailer it from Socal to our lake house on Lake of the Ozarks in Missouri. Thanks for all the help. Will post a picture when she hits the water. She’s lovely. Be warned that getting all the paint off the topsides and transom do you can varnish may be a real chore, and if you settle for just varnishing the transom to show that she’s wooden, the cognoscenti who troop to admire her will understand... The alloy spars may be original; they came in before GRP did. Last edited by rbgarr; 04-07-2019 at 11:35 AM. Stable, easily handled family daysailer with a lead ballast keel. Construction: Carvel planked over steamed frames. Alternative construction: Cold-molded or strip. Lofting is required. Plans include 9 sheets. That said, anything built by Douglas & McLeod is likely to have been designed by Sandy Douglas, but one thing still bothers me. 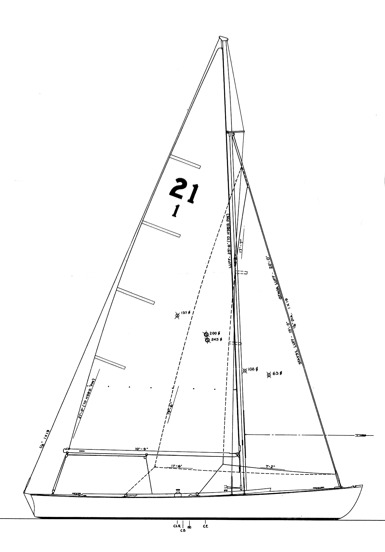 Sailboatdata.com lists Hogdon Bros. as a builder of the Great Lakes 21. Does that keel look right? Last edited by johnw; 04-08-2019 at 08:42 PM. Yes, that looks like our boat. Same keel. Just a note on the Great Lakes 21 mentioned, the pics i found look nothing like our boat. I haven't found any pix of the Great Lakes 21, so you're way ahead of me!